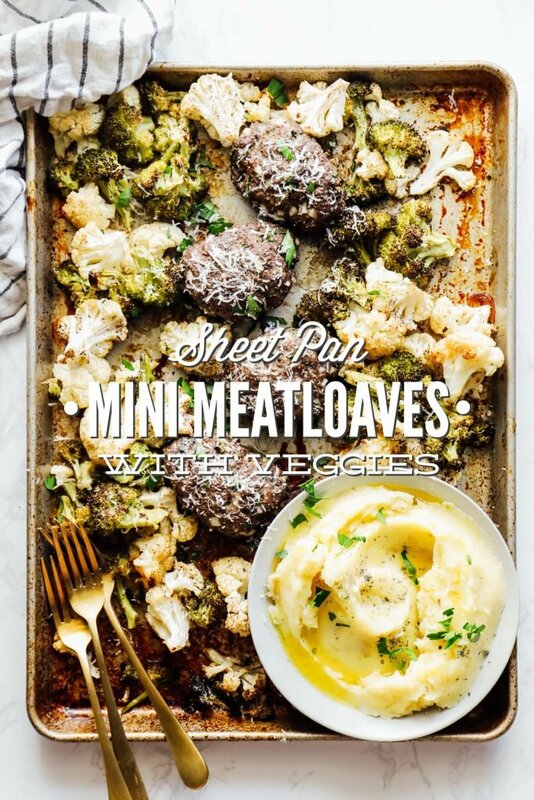 A sheet pan dinner is a great way to make a complete meal with minimal mess and in a minimal amount of time. Today, we’re going to branch out from the typical chicken sheet pan meal. 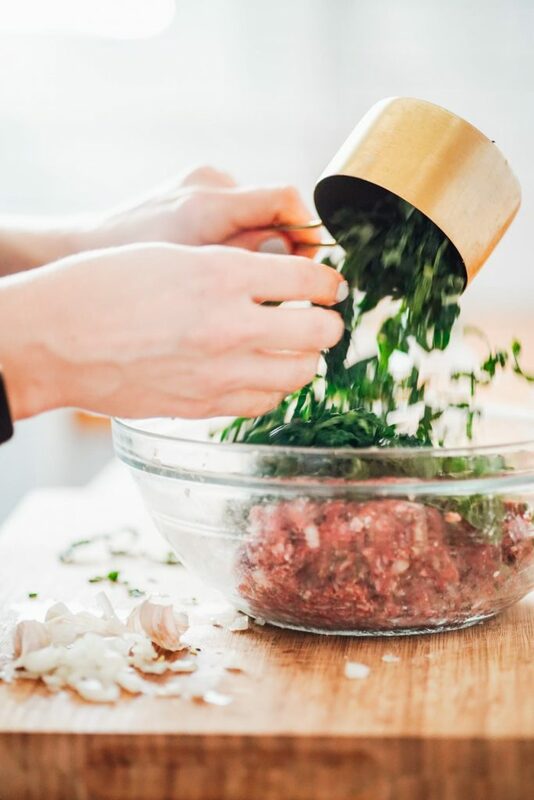 Instead, we’re going to use ground beef to make mini meatloaves that are loaded with leafy greens and served with veggies. What is a Sheet Pan Meal? A sheet pan meal is simply a meal that’s made on a sheet pan. The concept is similar to a one pot meal, but instead of a pot you use a sheet pan to create an entire meal. Sometimes a sheet pan meal is made on just one large sheet pan and other times the ingredients are divided between two sheet pans. The number of sheet pans needed depends on the ingredients used, the size of the ingredients, cooking times, etc. For today’s meal, we’re going to use one large sheet pan. 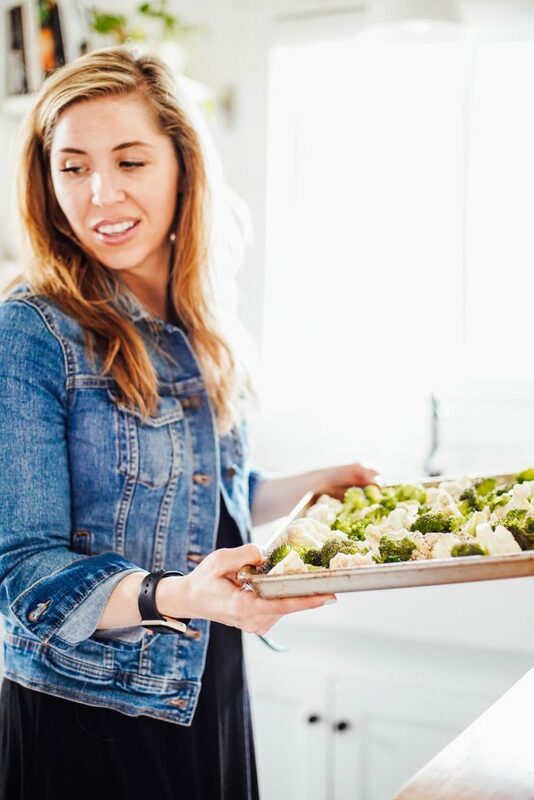 The idea of creating an entire meal on a sheet pan is to simplify in all areas: cleanup, the equipment needed to make the meal, the ingredients used to make the meal, and your overall time spent in the kitchen. Since we’re all about making real food simple, sheet pan meals fit into the Live Simply style of cooking. Sheet pan meals are usually made with veggies (which should be cut in a consistent manner), a protein, a fat, and seasonings. 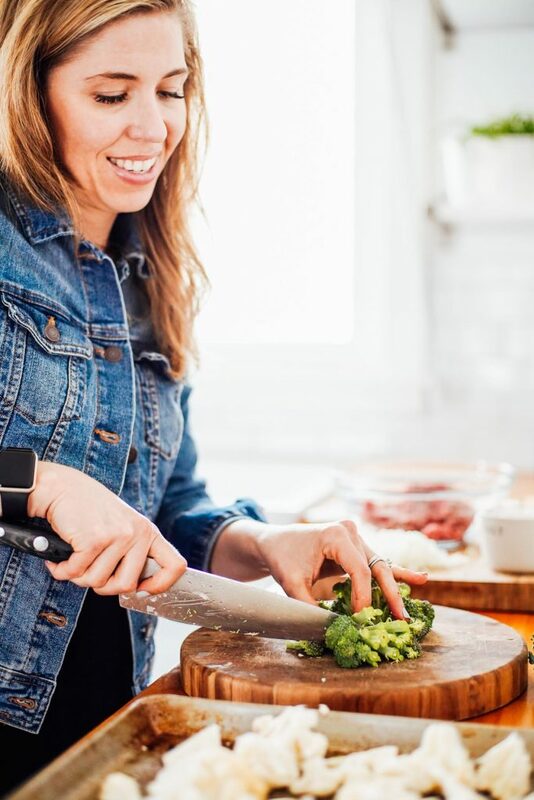 In today’s recipe, the veggies are broccoli and cauliflower, the protein is ground beef, the fat is olive oil, and the seasonings are salt, oregano, pepper, and basil. Once you have this formula down (veggie, protein, fat, and seasoning), you can create your own sheet pan meal recipes. First, before we talk about how to make this sheet pan dinner. Let’s discuss what exactly is a mini meatloaf. Think of mini meatloaves as individual-size meatloaf portions or giant meatballs. 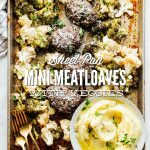 Either way, mini meatloaves/giant meatballs are super easy to mix together and form, and they bake up in under 30 minutes. Traditional meatloaf can take quite a while to bake (about an hour) so reducing the size of the meatloaf into smaller serving sizes means less time in the oven. 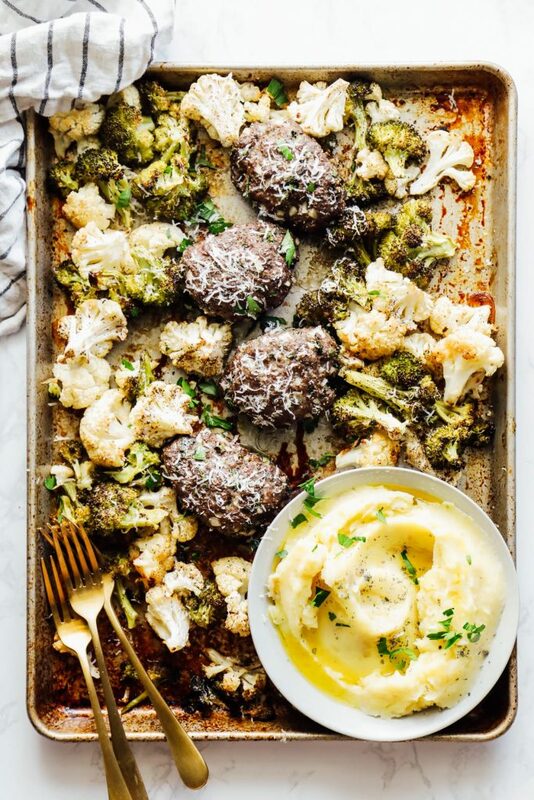 Since we’re going for one-pan, one-meal simplicity with this meal, cauliflower and broccoli are roasted up alongside the meat. Actually, the broccoli and cauliflower get a head start in the oven. While the broccoli and cauliflower roast in the oven, the meatloaf ingredients are mixed together. 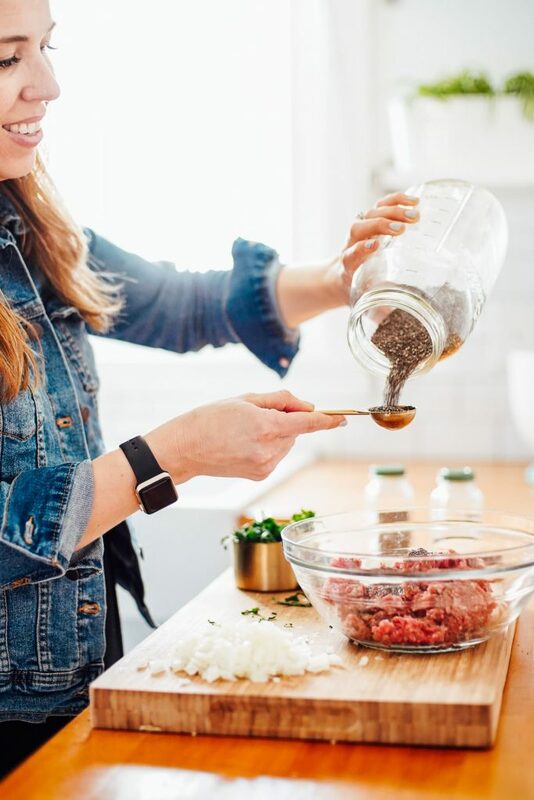 If you’re gluten-free, use chia seeds instead of panko breadcrumbs (they work as a binder) or gluten-free breadcrumbs (Ian’s brand is my favorite). 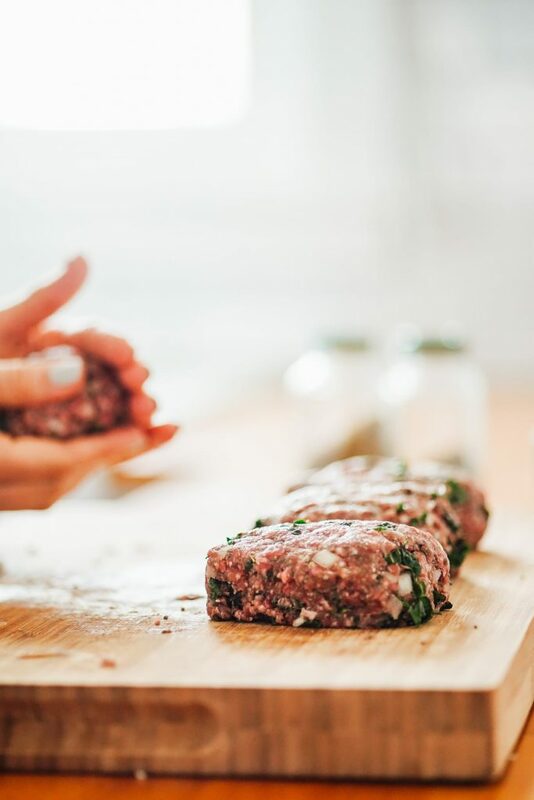 The meatloaves are made with a few basic pantry ingredients along with one surprise ingredient: fresh spinach! Because why not? Adding greens to meatloaf is an easy way to increase the veggies at mealtime. After 10 minutes, the veggies are removed from the oven and pushed to the perimeter of the sheet pan and then the mini meatloaves are added. 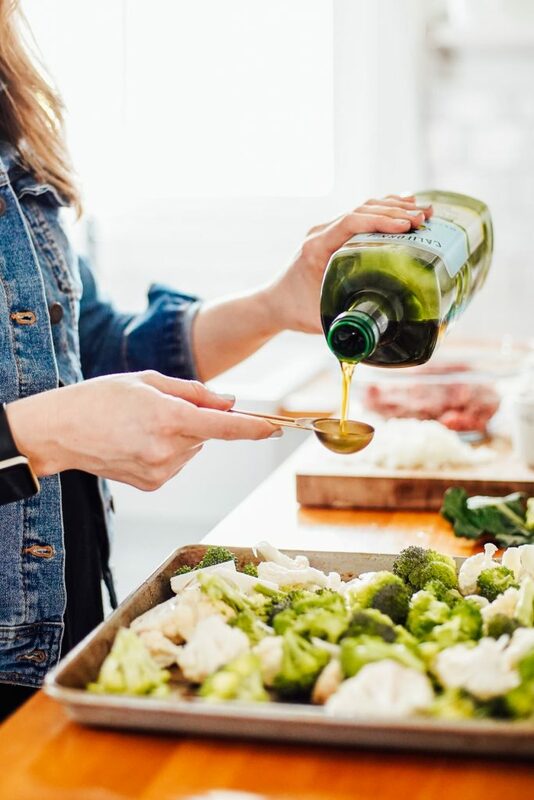 The end result is a nourishing, simple, and easy-to-make meal that requires very little clean up afterward thanks to the one pan nature of this meal. I know I just sold you on the one pan nature of this recipe, but I’m going to suggest making an extra side dish to accompany this meal. Trust me, this side dish is just as easy to make: Instant Pot Mashed Potatoes. First, mashed potatoes made in the Instant Pot are incredible! Second, making mashed potatoes in the Instant Pot is the easiest way to make mashed potatoes–just peel the potatoes, place everything in the pot, and let the Instant Pot work its magic. That’s it! Instant Pot Mashed Potatoes are the perfect accompaniment to this sheet pan meal. We love to spoon the warm potatoes on a plate or bowl and then top the potatoes with a mini meatloaf and veggies. Talk about nourishing comfort food. Of course, you can skip this extra step, but I highly recommend including the potatoes. You can thank me later. Chop the veggies in advance. Broccoli and Cauliflower are hearty vegetables that can be chopped days in advance. I try to chop these veggies as soon as I bring them home from the market or store. It only takes 5 minutes, max, and makes dinner prep so much easier later in the week. Form the meatloaves the night before or morning of. The meatloaves can definitely be formed ahead of time and then stored in a storage container (like this). Don’t make dinner at all. I’m just kidding. That would save time, but that’s not an option ;). We all gotta eat. Also, one more note about food prep. You can actually use this meal as a food prep meal. You know, a meal you prepare in advance and enjoy throughout the week. If you want to do this, I would use these containers and place the mashed potatoes (or quinoa or rice) on one side, topped with a meatloaf, and then add the roasted broccoli to the other side of the container. Reheat the meal in the microwave or oven, or enjoy at room temperature. 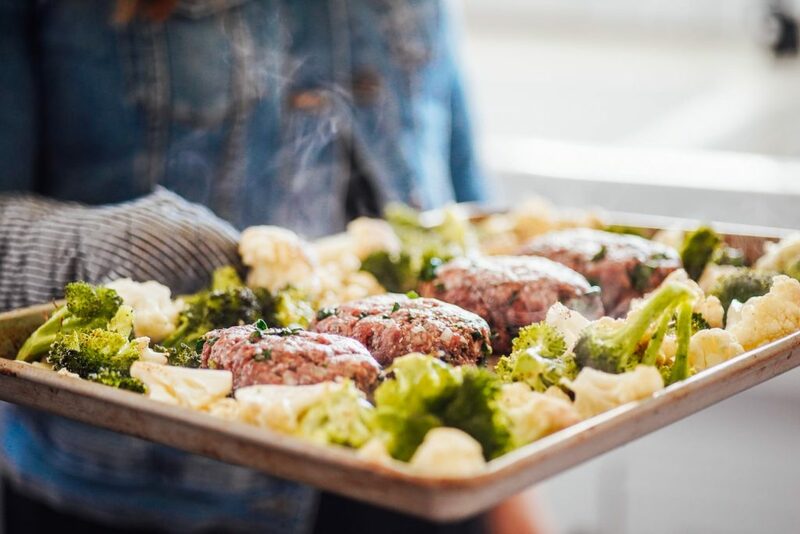 An easy meatloaf-inspired sheet pan dinner made with ground beef, spinach, broccoli, and cauliflower. Preheat the oven to 400F and line a half sheet pan with parchment paper. 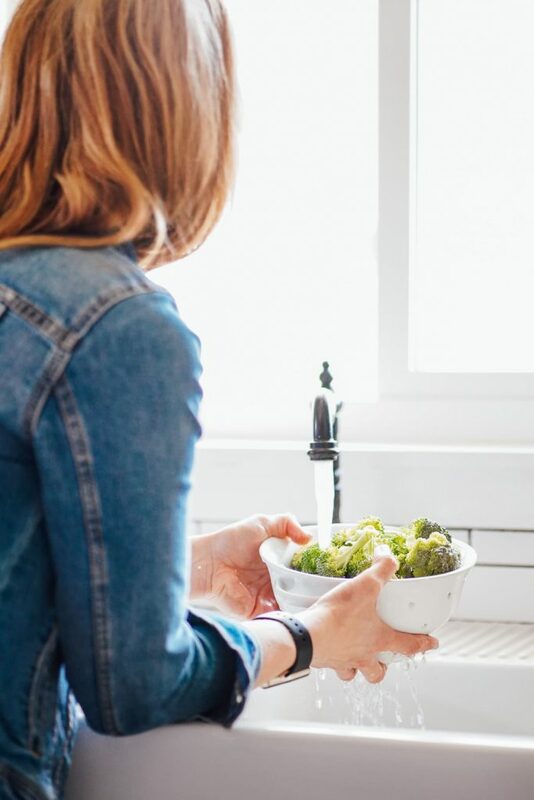 Wash and dry the broccoli and cauliflower and cut into florets. Remember, the veggies should be cut in a consistent manner, meaning each floret is about the same size to ensure even roasting. 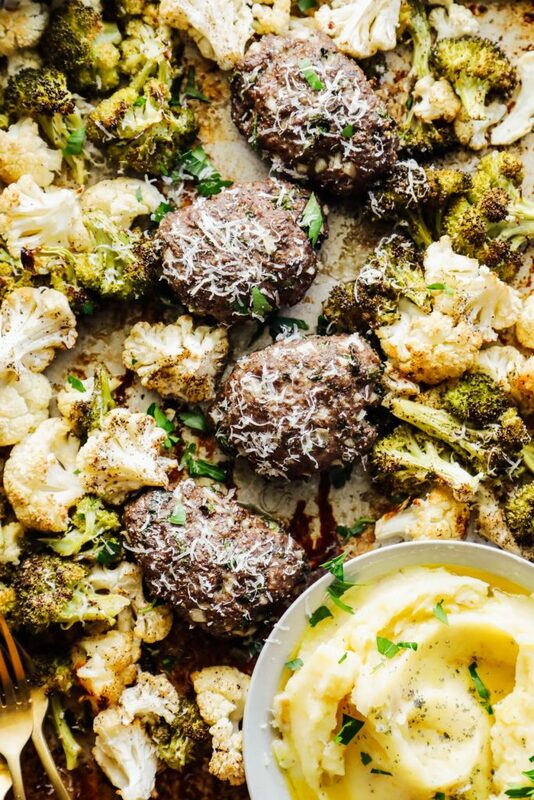 Place the broccoli and cauliflower on the prepared sheet pan. Pour the olive oil over the veggies and sprinkle with salt and pepper. Toss to combine the veggies with the oil and seasonings. Roast the veggies in the oven for 10 minutes. While the veggies roast in the oven, combine all meatloaf ingredients in a large bowl. Form into 4 equal “loaves,” approximately 1.5” tall. Remove the sheet pan from the oven. Push the veggies to the perimeter of the sheet pan, leaving room in the center for the meatloaves. Return the sheet pan to the oven for 20-25 minutes, or until a thermometer reads 160-165F. Optional: Sprinkle extra parmesan (a few tablespoons) onto the vegetables for the last 5 minutes of cooking. I highly recommend this step--it adds great flavor! Serve warm with your choice of side, if desired, such as: Instant Pot mashed potatoes, rice, or quinoa. Awesome! A new go-to in our house. Subbed Brussels sprouts for broccoli as what was on hand. I only recently discovered your website when I was searching out DIY natural cleaners a few months ago. 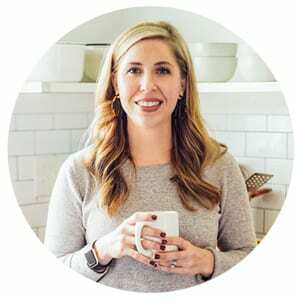 Been on the real food journey for about 9 years now, but your podcast (podcast rookie btw, can’t believe it took me so long to discover them, lol) has been eye opening – surprising since I felt that I am pretty knowledgeable. Love listening when meal prepping or cleaning! I need to leave a review, I swear, I’ll find time soon!!! Looking forward to trying the pizza muffins over the weekend. Will be my first experiment with Eikorn. Hey Kelly, Thank you so much for taking the time to share your note! This makes me so happy! 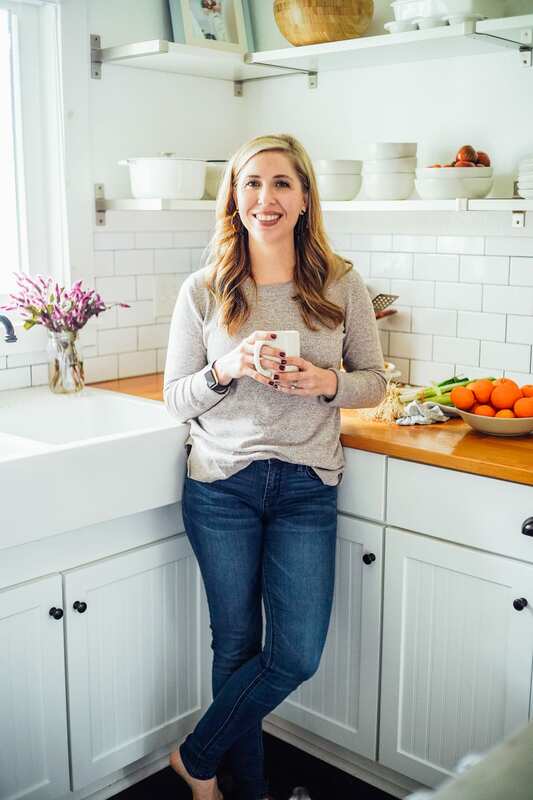 So glad you’re loving the podcast, the recipes, and the blog. And I can’t wait to hear what you think of einkorn.